Ramy had to retire in the 3rd game due to a niggling foot injury he’d been carrying for some time, but it was the physical pressure that Nick put him under that forced this retirement. Ramy was up 9-7 and 7-4 in the first two games and had it not been for the sheer determination of Nick Matthew he could have easily gone onto win the title. To see the final results and a match report from Martin Heath please click here. 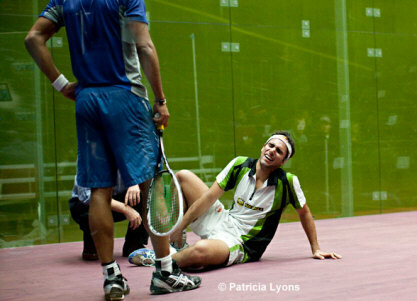 Karim Darwish (seeded #5) crashes out of the $94K PSA North American Open to Adrian Grant (#10) with a recurrance of an old ankle injury. 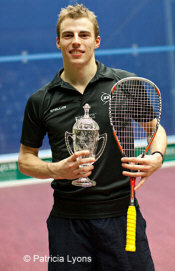 Karim was 2-0 up before being forced to retire to Adrian, went on to lose to the No.2 seed Nick Matthew today. The other interesting matches saw Thierry Lincou (seeded #9) beat Peter Barker (#6) 3-0 and James Willstrop (#7) beat Alister Walker (#12). Nick = future #1 !!! Lets hope so – it would be great to see him or James do it.